The San Jose Sharks losing streak has reached five games. Three of the five came against teams which won’t make the playoffs, only one of the five losses even reached overtime. Coming just weeks before the playoffs, this worrisome development might seem a major concern for the team favored by some to win the Western Conference and grab a spot in the Stanley Cup Final. Fortunately, a late-season losing streak isn’t a major deal any more than a winning streak is. Last season, the Anaheim Ducks were the league’s hottest team entering the playoffs, having finished the season on a 10-1-1 run. And they were swept out in Round 1 by the lower-seeded Sharks. The current losing streak isn’t helpful, but the Sharks bigger concerns go beyond the wins and losses. Erik Karlsson’s recovery from a nagging injury continues. The player and team have misjudged his progress before and both seem averse to taking any risk at this point in the regular season. This leaves the timeline for Karlsson’s return at the start of the playoffs. It is always tricky with a timeline driven by the calendar as opposed to the player’s health. If Karlsson is fully healthy for the start of the playoffs, the Sharks will get a lift. But perhaps not in the first game or two, as he reintegrates into the line-up. Further, the defensive pairings head coach Peter DeBoer will use are unclear, and changes could prove less than optimal. The Sharks are sitting in second in the Pacific Division, with a slim chance of getting the top seed. 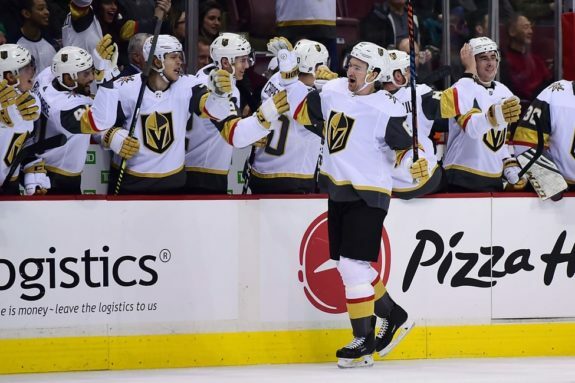 The Vegas Golden Knights sit in the third spot and while they might overtake the Sharks, they won’t be going any higher than second or dropping below their current spot. Which means the Golden Knights are the Sharks most likely opponent when the playoffs start. The Golden Knights in Round 1 represents a worst-case scenario for the Sharks. Vegas is playing well with a goalie whose been hot (though out for a few games with a minor injury). They hit the jackpot at the trade deadline, acquiring Mark Stone. Stone has provided an already strong team a major jolt. While earlier I dismissed reading too much into a hot team, Vegas isn’t so much hot as they are genuinely good. On top of all this, Vegas has had the Sharks number since they entered the league in 2017, in a way no other Western Conference playoff contender has. San Jose has just two regulation wins in 13 games against Vegas, and have managed to lose in almost every fashion imaginable, including multiple blow-outs. The Sharks have the talent to match up with Vegas, but they likely need to get rid of the ghosts of Vegas Past and Vegas Present. They’ll also need to make a few adjustments and now is a good time to insert them into their game in preparation for what lies ahead. As the likely series draws closer, we’ll cover these. 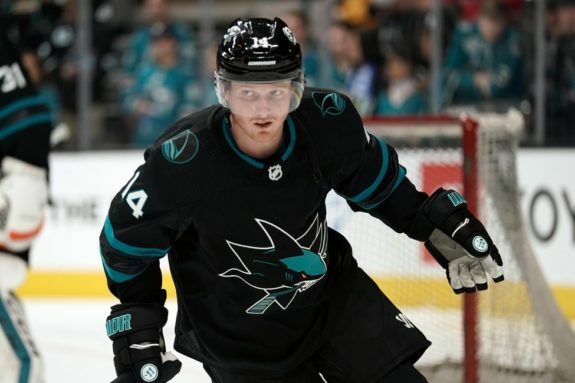 While Vegas made a major splash in acquiring Stone, the Sharks made a potentially savvy move in acquiring Gustav Nyquist from the Detroit Red Wings. Alas, Nyquist has not integrated well with the Sharks. This is concerning – some players take a while to adjust their game to new surroundings and new systems. For others, it never really happens. The Sharks hope Nyquist is the former, and in the closing games of the regular season, he finds a fit which works for him. The good news, the Sharks have only two games in six days, which gives Nyquist a healthy dose of practice time. More good news, Nyquist had a good game against the Anaheim Ducks. A sample size of one, though, is not yet a trend. Come playoff time, fourth-line minutes often shrink and the top three lines are expected to carry the load. Nyquist, assuming he can give the Sharks the productivity he provided his former team, is capable of playing big minutes on one of the top three lines, giving San Jose three very strong lines. But it isn’t happening yet and some even think he might get relegated to a fourth line role, which would be unfortunate. He averaged over 16 minutes a game in his first five games as a Shark, then 14 minutes a game for the next five. In the last two games, his ice time has popped up again, including a high with the Sharks of 18:38 against the Ducks. He needs it. There was reason for optimism upon Nyquist’s acquisition, but it hasn’t panned out. At least not yet. 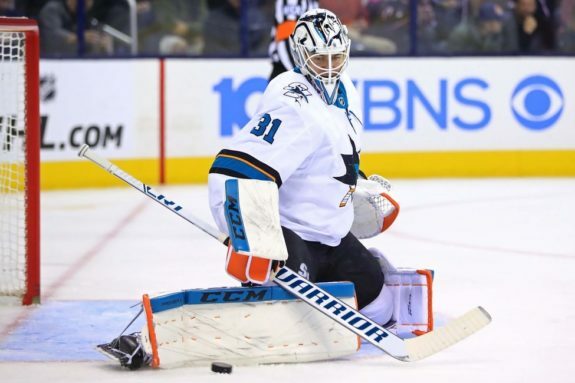 People really want starting goalie Martin Jones to snap out of his season-long slump. In small samples, some have found reason for optimism. In larger samples, the news isn’t great. DeBoer seems determined to force Jones out of his struggles by playing him almost every game. Thus far, the results haven’t been there, either. There was reason for optimism in February. Jones started the month well, coming out of the All-Star break, but faded. His save percentage (SV%) for the month was a mediocre .903. March also started off promising, but he’s now at only a slightly less mediocre .908 SV%. The eye test tells the same story, he is far from locked in. When I looked at the four keys for the Sharks back in December, one was the power play. The Sharks needed to up their conversion rate and up the frequency of drawing penalties against opponents. They’ve struggled to draw penalties all season, and it has gotten worse. Recently, they’ve failed to convert on the relatively few chances they’ve gotten. In the last ten games, the Sharks have converted on just three of 25 power plays. The conversion rate is poor, but 25 power play opportunities in 10 games (2.5 per game) is unusually low. The Dallas Stars have drawn the fewest power plays in the league, an average of 2.6 per game. I’m especially miffed on the inability to draw penalties. The Sharks have all the elements which tend to draw penalties in bunches. Strong puck possession, big bodies, speed and savvy. But when whistles are swallowed, it usually works against the Sharks. Even so, the power play has not been effective recently and while I’ll mostly skip the underlying issues, this must change. Fortunately, there is time to fix it. Two elements will help a lot: winning more face-offs and improved puck retrieval inside the offensive zone. The equally troubling news is the demise of the penalty kill, a major asset for a large chunk of the season. The penalty kill sits 19th in the league, but it was top-10 much of the season and often close to the top. 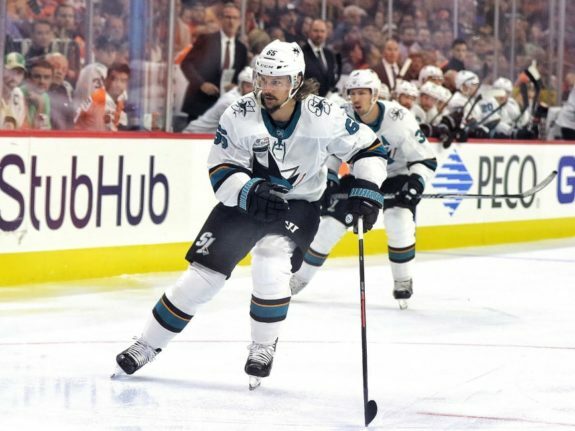 In the recent 4-3 overtime loss to the Anaheim Ducks, the Sharks gave up two third-period power-play goals to the Ducks’ 25th-rated power play. The Ducks had only three power plays all game. The penalty kill often defines how aggressive a team is during even-strength play. The stronger and more confident teams are at killing penalties, the more aggressive they can play. It is a big benefit to those teams with both confidence in their penalty kill and the play to back it up. Right now, the Sharks have neither. 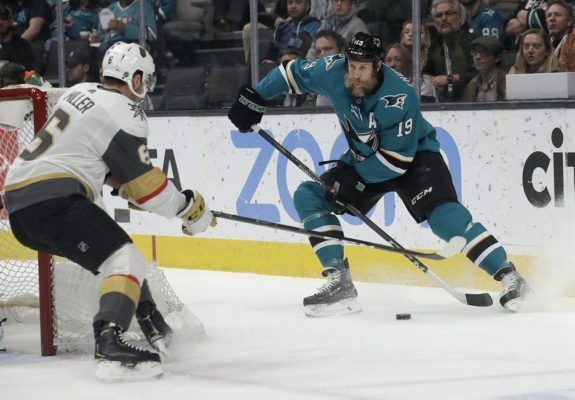 Some will offer reasons for the Sharks recent problems, like the injury to Joe Pavelski or Logan Couture’s one-game absence. But the losses are not nearly as important as turning around the important trends. A lot can change from the last day of the regular season to the start of the playoffs and there are still two weeks until the end of the season. There is no reason to panic. But things do need to change by the start of the playoffs and San Jose needs to focus on the things which are most important. Right now, wins and losses are secondary. Getting the pieces working again matters more.